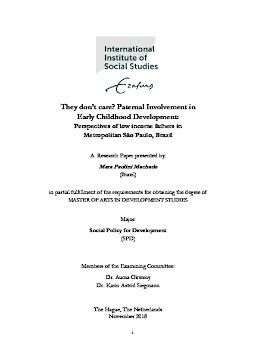 This research paper deals with the involvement of low income fathers’ with children under six years old having the metropolitan area of Sao Paulo as its territory. The objective is to examine the ways in which they practice and engage with early childhood development, and describe the main factors defining father’s involvement. For that, I tease out and explore fathers’ perceptions and how their involvement is framed and understood taking into con-sideration the broader landscape of cultural norms, policies and services. This was a qualita-tive research project, and the semi-structured interviews were used aiming to give voice to men’s, in opposition to mainstream research which collects data of their involvement from mothers. The provocative research title has an answer, men do care and are involved with their children. However, their involvement should be considered under a more nuanced and flexible spectrum rather than a binary, which does not consider the set of vulnerabilities and constraints low income men face. These constraints are not only economic, but also cultural, social, and institutional norms which are mutually reinforced by the existence of strict gender norms that shape fatherhood in Brazil.